The first assignment of the Hyperlinked Library MOOC requires participants to “consider one of these two questions by adopting a role: either that of community guide or community creator“. The tasks are to identify a community, analyse the community and write an engagement plan. A blog post should be used for the assignment and the post should be written in the first-person. There is no formal word count requirement, but the post should provide links to relevant resources where appropriate. My post will describe my role as a community guide for Web managers in UK universities. This is an existing community which I have helped to developed in my previous role as UK Web Focus at UKOLN. The community was based around an annual event, the Institutional Web Management Workshop (IWMW) which I established in 1997. Following the cessation of core funding for my host organisation in July 2013 the future of the event is now uncertain. However I do have continued interests in working with this community. This community consists of people with responsibilities for managing large-scale university Web services. The purpose of the community is to enable the community members to work more effectively as a group than would be possible by working in isolation. Many members of the community do meet, at the annual IWMW event and at other events, including regional events or more specialist events such as events for developers, marketing people or those with particular interests in elearning, eresearch, etc. The community tends to be proactive in sharing information related to significant national developments. Recently this has included the launch of the ‘cookie’ legislation and the requirement of all universities to provide standardised KIS (Key Information Sets) data elated to the student experiences at UK universities. In the past discussions did take place on email lists about specific technical issues, but the decrease in use of the main national mailing lists has seen a drop in such discussions on centralised mailing lists. Web managers have represented one of my key communities during my time at UKOLN. Now as an independent consultant I will be looking to build on my connections with this community. In addition to continued involvement on relevant mailing lists I intend to continue to publish surveys of institutional use of social media within the sector, which can help to stimulate discussion and debate and inform the development of best practices. In addition to involvement online I also hope to attend a number of events which will provide opportunities for face-to-face meetings. I will publish details of surveys on the main mailing lists for the community. I will also announce plans for the future of the IWMW 2014 event which will include details of further engagement with the community online. The benefits of the event will be described following an analysis of the survey carried out during the IWMW 2013 event. The sustainability of the event will be described in a business plan which will include details of the relationships with other organisations with whom I will be working. Who would I contact in the community? How would I contact her? What would I say in regard to what the library/organization or I could offer to her community? How would I explain the symbiotic relationship that could emerge between the community and my library/organization? More detailed plans will be outlined in this blog shortly. The Library of the Future (Part 6): The End of History? The End of History and the Last Man is a 1992 book by Francis Fukuyama, expanding on his 1989 essay “The End of History?”, published in the international affairs journal The National Interest. In the book, Fukuyama argues that the advent of Western liberal democracy may signal the endpoint of humanity’s sociocultural evolution and the final form of human government. Are we seeing the end of history for libraries? Will the ‘hyperlinked library’ mark the end of developments, with the ideology of, say, the collection-focussed library being consigned to history and the global social networks infrastructure being provided by companies such as Twitter, Facebook and Google? 1. Whenever possible, use tools that already exist. Don’t reinvent the wheel! If you can utilize a current social media platform which does everything you want, you don’t need to create something from scratch that users won’t be as familiar with. Even something as simple as a message board will be used more often if students can log in with a Gmail or Facebook account instead of having to create an entirely new profile. However it would be a mistake to take this advice too literally. I feel this advice is based, in part, on the support benefits which can be gained from standardizing on common applications but, more importantly, the benefits to be gained from use of common social web service which can improve as the numbers of users grow (e.g. there are more people with similar interests who can provide relevant advice and answers to queries). But does this advice suggest that, although there may be changes in the tolls and services used to deliver the hyperlinked library environment, the hyperlinked library represents the pinnacle of library evolution? The hyperlinked library has been described as “an open, participatory institution that welcomes user input and creativity” which “provides spaces and places for users to interact, to collaborate and to create content“; in brief the hyperlinked library “is simply the Read/Write library, where conversations, connections, and community are born“. But of course we didn’t see the end of history, with Francis Fukuyama failing to foresee the implications of the fall of the Berlin Wall, the 9/11 bombings and the economic crisis. The era we are currently living in will provide interesting material for future historians! Might there also be a move away from the hyperlinked library? What could come next? The hyperlinked library based on popular global services such as Facebook and Twitter could be replaced by open source alternative which address concerns such as the ownership of content posted on such social networks, privacy concerns, etc. Although such alternatives, such as app.net, have not gained a significant user base, we could imaging a scenario in which there is a backlash against the current market leaders (perhaps a reaction against these companies providing access to personal data to the US authorities?). But, as described in Michael Stephens’ summary of the characteristics of the hyperlinked library, the vision isn’t dependent on any specific services. Such a scenario might represent a development (a welcome development for many, I suspect) of he hyperlinked library, but not the demise of the hyperlinked library. A few years ago after the ‘Web 2.0’ term (and the ‘Library 2.0 ‘term) grew in popularity we saw the term ‘Web 3.0’ beginning to gain some momentum. This term was a rebranding of the vision for the Semantic Web environment. According to Sir Tim Berners-Lee “The Semantic Web provides a common framework that allows data to be shared and reused across application, enterprise, and community boundaries“. Might library services based on the Semantic Web (or Linked Data) – Library 3.0 – emerge as a replacement for the hyperlinked library? Sig.ma provides an example of a tool which provides “a demonstration of live, on the fly Web of Data mashup. Provide a query and Sig.ma will demonstrate how the Web of Data is likely to contain surprising structured information about it (pages that embed RDF, RDFa, Microdata, Microformats“. 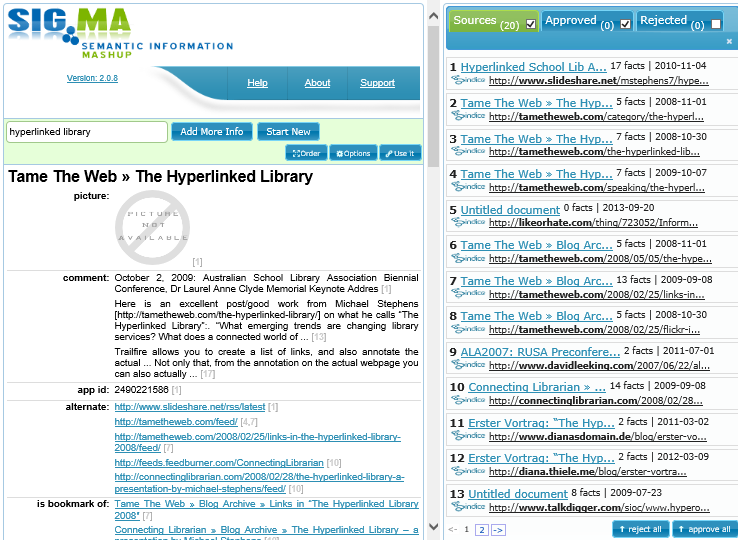 As shown in the image a sig.ma search for “hyperlinked library“ provides many search results from social web tools, such as blogs, Slideshare, RSS aggregators, etc. This would suggest that the technologies used to provide the hyperlinked library will provide an evolutionary path to a more structured linked data environment. But if it does not appear that there are technological developments which would make the hyperlinked library obsolete, perhaps we might find that users lose interest in the highly connected environment which the hyperlinked library seeks to provide. Might the development which could make the hyperlinked library obsolete simply be a loss of interest from the user community? Spam: Just as the early generation Internet services such as Usenet fell into disrepute as they became channels for spammers, we could see today’s social media services become marginalised due to a takeover by spammers and marketeers. Lack of trust: People may feel that social media services aren’t to be trusted, and move to more traditional information sources. Information overload:Users may react against the information overload which social media services may provide be ceasing to make use of the services. Reactions against government monitoring: User concerns that government is spying on their use of online services may result in a move away of use of such services. Reactions against commercialisation of social networks: User concerns of commercial exploitation of their use of online services may result in a move away of use of such services. Moves towards hyper-local services: Rather than ceasing to make use of social media services, user may move to ‘hyper-local’ services which are used by known friends, lading to fragmentation and the loss of the benefits of scale provided by global companies. Fashions change: se of social media may turn out to have been a fad, which ceased to be fashionable. The Library of the Future (Part 5): Everyone’s A Librarian! In a recent series of posts on this blog I have explored a number of scenarios for the development of the hyperlinked library of the future. I have suggested that such developments may lead to a privatised library environment, an environment which provides services primarily for the self-motivated middle classes, an environment which fails to consider fundamental assumptions which will affect the sustainability of a hyperlinked library and a library which is part of a dystopian future digital landscape. These posts (which led to the award of a Devil’s Advocate badge for heretical thinking!) addressed concerns which I have. I was early to embrace the notion that social media could provide professional and organisational benefits, as described in the paper on “Library 2.0: balancing the risks and benefits to maximise the dividends” which I presented at the Bridging Worlds 2008 conference and was subsequently published in the Program journal. The ideas in the paper built on a paper entitled “How to Stop Thinking and Start Doing: Addressing Organisational Barriers” published in 2007 which argued that cultural heritage organisations should be embracing the social web, rather than worrying about that all concerns about its use had not been fully answered. However in 2009 a paper entitled “Time to stop doing and start thinking: a framework for exploiting Web 2.0 services” suggested that there was a need to consider challenges to sustainable use of social media in a more in-depth way. Now, five years after I presented the paper on Library 2.0: balancing the risks and benefits to maximise the dividends at the Bridging Worlds conference in Singapore there is an even great need to understand the possible implications of institutional moved to what is being referred to as the hyperlinked library in order that risks can be properly appreciated, addressed or even accepted. One final scenario is an environment in which the skills and expertise possessed by the hyperlinked librarian are widely embedded by the majority of adults. We are already seeing skills in managing and curating digital resources being required in order to manage content created through use of digital cameras, camcorders and MP3 players, including use of metadata to manage and find large numbers of resources. The TV provides another example of how search skills are needed to find and access resources of personal interests: whereas once we had a handful of TV channels, with the resource discovery information being published in newspapers daily, now we have 7 day electronic program guides covering over a hundred digital TV channels – again large numbers of resources to search through and, if the programmes are recorded, subsequently managed locally. But if the need to make use of metadata and knowledge of search techniques in order to manage one’s digital environment illustrates how librarian 1.0 skills are becoming relevant to everyone, it is the importance of social networks for resource discovery and learning for everyone in which we see a future in which the hyperlinked librarian is simply a skill which everyone will be expected to have. The popularity of such social discovery skills can be gauged from the article in The Metro (a free newspaper published in the UK and made available on buses and trains in a number of towns and cities) last week (Thursday 10 September 2013). The article, “We’re Starting to Trust Twitter Over Google” described how “looking closely at user behaviour across Britain [we] found we are relying less of traditional search engines such as Google to find content. Instead, we’re becoming more comfortable scanning and processing long streams of information from Facebook pages and Twitter feeds – content delivered to us be people we follow“. A blog post by the author of the article, Suranga Chandratillake, founder of the Internet Media Platform, provides additional information: “We also conducted our own Nation of Sharers study that found that nearly half (43%) of people aged 18 – 24 prefer to discover through their social networks rather than search engines. This means we are starting to trust twitter over Google. Traditional search will always have a place – but the balance is definitely shifting“. Such social sharing is taking place in a variety of contexts. These days I find myself browsing for goods such as books, DVDs, gadgets and holidays on services such as HotUKDeals. This services allows users to upload information on cheap deals which can be voted on, so that the crowd can identify good deals. We are seeing hyper-connected individuals emerging on such services, who are good at finding and sharing relevant information. One example of Sunshine Stacey who provides details on holiday deals. As can be seen from Sunshine Stacey’s profile, the service provides statistics on users’ engagement with the service, with Sunshine Stacy having posts details of 283 deals which have had 1.0 million views and have had almost 4,000 comments. It should also be noticed that the service also provides badges, with Stacey having 8 badges shown on her profile page. What are the implications if the skills in being highly connected in order to maximise opportunities for finding information of relevance and engaging in discussions with one’s trusted networks in order to validate the relevance and accuracy of such resources and enhance associated learning through discussions based on the resources? Might it mean that librarian skills will only be needed in very specialist areas (such as medical and law librarians) or, alternatively, for engaging with patrons who do not have the necessary technical and social skills and who would otherwise be left behind in an environment in which mastery in use of social media will be needed? The Chauffeurs of the Twenty-First Century? Imagine a young potential librarian-to-be contacts you and asks you for advice on whether he should enter the profession. What picture of librarianship should you paint? I believe it would be irresponsible not to at least mention the challenges and potential stumbling blocks that libraries are facing in the future, so they will know what they will be up against. I agree that it would be irresponsible to paint a simple picture of the hyperlinked library. I’ve shared a number of other scenarios. I’d welcome feedback and comments, including those who disagree with the scenarios I’ve described! 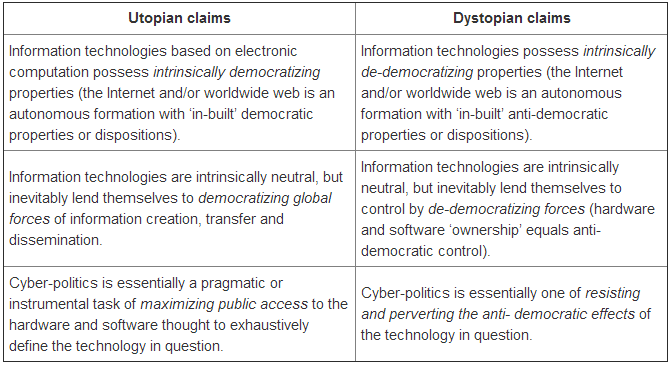 The Library of the Future (Part 4): A Dystopian Future? In previous posts in this series I have asked whether the vision for The Library of the Future will be based on A Privatised Future or the provision of Services for the Self-Motivated Middle Classes. In a post entitled Because We’re Right! I also argued that there was a need to consider the assumptions which may be made when planning development of a hyperlinked library. The aim of this series of posts is to encourage debate on alternative visions of the future of libraries which go beyond a technical deterministic utopian vision. Such considerations were addressed last year in ‘eLearning and Digital Cultures’ MOOC organised by the University of Edinburgh (which will be repeated later this year). David Hopkins took part on the MOOC and provided a useful summary of his experiences on his blog. The post on “Reflection on the ‘eLearning and Digital Cultures’ MOOC, Wk.1 #edcmooc” described the terms ‘utopian’ and dystopian’: “in relation to education and technology: ‘utopian’ (creating highly desirable social, educational, or cultural effects) or ‘dystopian’ (creating extremely negative effects for society, education or culture)” and summarised utopian and dystopian claims as show below. The MOOC provided a number of video clips which illustrated how popular films show how the dreams of a utopian future can founder. David described how “One film I felt could be used to highlight the technology/natural divide is Bruce Willis’ ‘Surrogates‘, where “humans live in isolation and interact through surrogate robots”. A trailer for this film is shown below. Will Librarians Help to Build This Dystopian Future? The ‘eLearning and Digital Cultures’ MOOC was aimed at the e-learning community and appeared to be particularly popular in the higher education elearning community in the UK. It was interesting, I felt, that this MOOC, one of the first MOOCs organised in the UK, began with such a challenging view of technological developments, This contrasted strongly with the resources which have been used so far in the Hyperlinked Library MOOC, which have typically provided an optimistic vision based on pioneering work of early adopters of networked technologies in libraries. There was an aspect of American culture, the relentless desire to make things whole and happy, that crucially overwhelmed its attempts to say something lasting and serious. If the French have a tendency to problematise, the Americans do the opposite, cheerfully skirting over pain, ambiguity, nuance. Do Americans skirt over the pain and ambiguities of the implications of pervasive social networks? Or do the Brits, along with the French. problematise? As a Brit I would warn of the dangers of a failure of those involved in developing visions for the library of the future to consider the dystopian implications of cheerfully embracing technological determinism! The Library of the Future (Part 3): Because We’re Right! The approach taken in the Hyperlinked Library MOOC is to stimulate discussion and debate as learning can arise as a result of such discussions. The MOOC provides a series of lectures from guest speakers and recommended readings but it is not envisaged that the learning will arise purely as a result of passive consumption of these resources, but in engaging in discussion on the issues raised in these resources – and also, I would argue – in the gaps in the resources and the assumptions they make. In my first post in this series, The Library of the Future (Part 1): A Privatised Future?, I raised concerns that the library of the future would be based on privatisation of the library infrastructure and a deterioration in the working conditions for those working in libraries. The second post, The Library of the Future (Part 2): Services for the Self-Motivated Middle Classes?, suggested that the moves from the physical environment and face-to-face interactions t use of networked technologies and engagement in virtual spaces could result in a devalued experiences for those unable or unwilling to make use of such networked technologies, with the benefits being gained by sectors who least need such external support. This post considers the implicit assumptions which this MOOC makes, that the hyperlinked library unquestionably provides a model for the future and the need is to learn from the early adopters of hyperlinked libraries and share best practices. At the IWMW 2013 event which I organised, Neil Denny gave an inspiring talk on “The Delicious Discomfort Of Not Knowing: How to Lead Effectively Through Uncertainty“. As described in the Storify summary of the talk “Neil Denny explored the experience of living through uncertainty and the communicative challenges that can arise out of our belief in our own knowing. Denny argued that we should embrace living on the edge of our comfort zone and get used to existing in that uncertain space to help develop coping mechanisms“. 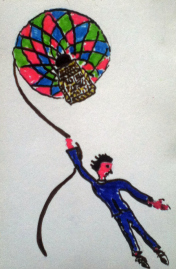 In a post entitled Fake Certainty published yesterday Neil revisited these ideas.The post described the hot air balloon peril: as “a result of over-commitment, where we resolve to pursue a particular route and, having made that choice, we then find it is becomes increasingly impossible to deviate from it“. Is the hyperlinked libary of the future based on ‘faked certainties’, I wonder? I’d therefore like to explore some of the certainties which advoicates of greater use of networked technologies in libraries seem to tend not to question. What ‘Fake Certainities’ Might the Hyperlinked Library Be Based On? The relevance of learning through connections: Will the benefits of learning through one’s rich set of connections which are provided by use of social media be relevant in all contexts, for all people, in all areas, at all times? If not, when are alternative approaches needed? To what extend can we trust our networks: How do we address the dangers of errors, lies and misinformation being disseminated on network tools such as Twitter? Might significant misuse lead to a backlash and a return to a preference for traditional trusted sources of information? “…general users “do not rate most library services as very private” even though “the majority do not read library privacy policies.” Most users do, however, “feel commercial sites keep their personal information secure” but only “about half think library Web sites keep their personal information secure“. The nature of trust of commercial social network services is also increasing with use. Will users continue to be prepared to make use of Google, Twitter Facebook, etc.? : Although concerns over privacy, content ownership, terms and conditions, etc. are well-known and do not seem to be a significant barrier to continued use of these services, what would be the implications for a hyperlinked library organisation which was dependent on use of these services if users decided to stop using the services to a significant extent? Changes to the technological infrastructure: As Tony Hirst has recently described in a post entitled “Remembering a Time When the Web Was More Open…?” on his OUseful blog “Twitter gave up on RSS/Atom, opting for JSON instead; … Authentication also killed off a whole range of Amazon related mashups“. Might continued changes to the technological infrastructure used by large-scale providers of the services used to provide hyperlinked libraries lead to significant problems in use of the services? Legal issues provide significant barriers to use of networked services in a library context: Pressures on libraries to ensure that their services do not infringe on copyright owners rights and to provide a safe and trusted environment for library patrons results in a move away from open social web services and greater use of managed ‘walled gardens’. Perhaps these issues are somebody else’s problem? But if there is a belief that the future for libraries is dependent on a transformation to ‘hyperlinked libraries’ surely these and similar issues will need to be addressed? Acknowledgement: The image used in this post was taken from http://theleagueofnotknowing.wordpress.com/2013/09/16/fake-certainty/ and used with permission. The Library of the Future (Part 2): Services for the Self-Motivated Middle Classes? “These characteristics are just some of the facets of what I believe will make libraries truly innovative, useful and needed in the 21st century” – the final sentence on the article on The hyperlinked library. “The direction academic libraries take is up to us. It’s ours to figure out. So let’s not be satisfied by adding small features, but instead, let’s use our imaginations to dream big and create amazing experiences that transform our users.” – final paragraph in the article on “Facing The Future: Think Like A Startup” (PDF format). “cell phones, laptops, and the Web are rapidly becoming the best tools we have for staying connected to the people and ideas and activities that are important to us” – from the final paragraph of the article on Social Machines: Computing Means Connecting. “can make your imagination stir to life and water the garden where hope for something more might take root” – from the penultimate paragraph of the blog post on Finding the Future. I also watched a video on “Library of the Future in Plain English”. As described in my first post in this series which seek to critique these seemingly uncritical views of the future for libraries in a highly connected digital environment role this video depicts a future which, from a UK perspective, seems to run counter to the ethos of public service and the trusted and neutral values which librarians have. Perhaps such values are no longer relevant or can be provided by for-profit companies which can stimulate innovation by exploiting new business models. But if this is the case, there needs to be an open and public debate about the nature of the changes which embracing technologies, and in particular social media technologies which are typically owned by global companies based in the US. Library Services For The Self-Motivated Individuals and the Middle Classes? But in addition to the issues related to the ownership of the social media services and the terms and conditions governing use of such services there is also a need to consider whether the emphasis of networked technologies will undermine the services libraries have traditionally provided for a broad set of communities. Recent years have seen a drive towards higher participation rates in both the UK and US … but above 40% participation rates problems occur. Issues around massification, cost shifting (where governments push the costs onto students), and student loans are all at play. There is also the influence of Baumol’s disease, where disciplines like the performing arts, are unable to make efficiency savings by reducing teacher to student ratios. Anya argued that the combination of cost, access and quality made a compelling “case for radical innovation” in higher education. Shifting towards open content, socialisation and accreditation could result in that radical innovation, and Anya expanded on the benefits of Open Educational Resources, Personal Learning Networks and open accreditation approaches. Citing developments like Mozilla drumbeat’s P2PU – School of Webcraft, Anya described how “professional networks can bypass the need for diplomas”. She concluded with the prediction that new business models for HE would emerge, as mp3 players and digital music had transformed the business model of the music industry. Don’t have access to networked technologies, smart phones, etc.? Don’t have the skills or confidence to use networked technologies? Are not prepared to use services which require the user to allow commercial exploitation of their content or who do not want their preferences and network details to be mined for commercial exploitation? Feel that use of such services contravenes legislation in their country or who cannot access such services as their host environment does not provide access due to legislative concerns (e.g. EU data protection legislation)? Are concerned that their personal content hosted by US companies will be accessed by US authorities? It’s far from the end for public libraries. It’s easy, in these tough times, to only listen to the naysayers and prognosticators of doom, to only hear those in our community calling for the elimination of libraries. But limited tax revenues, the Internet, and eBooks are not burying the public library. Limited tax revenues will force us to become more efficient, the Internet is part of our future, and eBooks are simply another delivery vehicle. We control this future, and we can make it a successful one by making full use of the tools at hand. But does addressing the economic challenges require that we fail to acknowledge other concerns I have listed above? The Library of the Future (Part 1): A Privatised Future? I am co-facilitating a day’s workshop on “Future Technologies and Their Applications” at the ILI (Internet Library International) conference in London next month. This MOOC is providing an ideal opportunity for me to think about issues which myself and Tony Hirst, my workshop co-facilitator, should address at the event. In particular the MOOC is enabling me to reflect on the role of the library in the future, going beyond the technologies which will be the main focus of the workshop. One of the recommended readings (viewings?) for the MOOC is the YouTube video entitled “Library of the Future in Plain English” by Mal Booth, Sophie McDonald and Belinda Tiffen of the University of Technology Sydney (UTS) Library. … we’ll need to rethink our work conditions. Library staff work regular hours. We’re not quite 9 to 5 because libraries are often open long hours. But we will all come to work and spend most of our day at our desk in a back room probably with some rusted time at a service desk in the public spaces. This old way of doing things isn’t going to fit with the new library. The new library will be available 24/7 and online will be just as important as the physical building. We’ll have to have staff working flexible hours who may not be in the library building at all. They might work from home and use mobile technology to provide information services from almost any location, from a cafe, to a classroom. Librarians will be both online and in the physical library and that means a whole new service model. Librarians love to help people and connect them to information and ideas. But sometimes, it could be hard for people to approach us when we’re behind desks or hidden away in offices. We can see more authoritative and anonymous to our clients or like we are there to enforce rules rather than help. We all know and hate the stereotype of the pearl-wearing librarian who goes around shushing people, boo! A new service model will let us show that librarians are creative experimental and open. We could become part of research teams embedded in faculties, coaching facilitating and offering new services in ways which are proactive providing advice in the information before our clients even know they need it. We can borrow ideas from other sectors like retail.Think of the Apple store where there are always geniuses to help you and the service feels personal. We can go in further by letting our personality show, especially online where we can use services like Facebook to create profiles and connect with the people who would most benefit from our expertise in ways which are collaborative. the old way, boo! The new library buildings can be built to the highest grain specifications with features like rainwater collection, alternative energy use, waste water recycling and green furnishings. But sustainability isn’t just about the building. It’s about new attitudes and new ways of working. Libraries can encourage their staff to take public transport or walk or bicycle to work by providing storage areas for bikes, shower rooms and staff reward programs. It also models behavior for our clients so there’s a ripple effect outwards. The people who work in libraries are generally classified by their position, the props of material they work with or by their role in the hierarchy as managers or workers. These kinds of roles are not going to suit the new way of doing things. We need to have much more fluid and adaptable roles. Would you rather be a cataloger, an IT technician or a media curator, a learning and gaming consultant. In the Library of the Future, we’ll need people who are creative, open to challenges and tolerant of mistakes. People who are team based and client focused, rather than hierarchical and rules focused. The new librarian is open to new possibilities and is constantly evolving. The video is one of a series of recommended readings for the first module of the Hyperlinked Library MOOC, which addresses The Hyperlinked Library Model & Participatory Service. The tone of the MOOC, the associated discussions and the resources is very up-beat and optimistic about the future of the “hyperlinked library”. But this optimism jars for someone who has been working in the UK and has been observing recent changes in the public sector, including higher education and public libraries. In the UK we have been seeing a ‘perfect storm’. Others on this MOOC will be very aware of the changes which rapid technological developments continue to provide – and this MOOC is about how such changes can be implemented in a library context. The implications of the economic crisis will also be widely appreciated, although this will have affected the MOOC participants differently, in light of the geographical spread of the participants. However the implications of the political changes in the UK are likely to have had direct relevance to the six or so MOOC participants who have geo-located their institution as being in the UK. In brief we have seen the coalition government introducing significant increases in tuition fees for students going to university and cuts in funding for public libraries which is leading to closures of public libraries. In addition to the changes in the political and economic environment CILIP, the Chartered Institute of Library and Information Professionals is currently looking to change its name, which has led to heated debate about the rebranding and the role of the professional body. With this backdrop, the positivity of much of the discussions and the associated reading materials on The Hyperlinked Library MOOC seems to ignore the realities of the library environment in the UK. Voices For The Library, a campaigning organisation in the UK has published a manifesto which describes its vision for the role of public library services. I have annotated a number of the key points from the Library of the Future video, outlining how the library of the future could be implemented. This vision of the future is not necessarily one which the Voices For The Library would endorse! Libraries can be fun places to work, but they are also part of large organizations and therefore can be bureaucratic, with a very hierarchical organization structure. Often, the task we have to perform will be carried out in different departments. This can lead to silos where there is little communication between staff in different areas Libraries reflect the welfare state environment which has been discredited. We are going to change things. We’ll have to have staff working flexible hours who may not be in the library building at all. They might work from home and use mobile technology to provide information services from almost any location, from a cafe, to a classroom You’ll still be on duty at home or during your social hours! But sometimes, it could be hard for people to approach us when we’re behind desks or hidden away in offices. We’ll run a knocking campaign in the tabloid papers to gain public support for the changes. We can see more authoritative and anonymous to our clients or like we are there to enforce rules rather than help. We all know and hate the stereotype of the pearl-wearing librarian who goes around shushing people, boo! Tabloid editors, feel free to use those stereotypes. Why do you think we mentioned them! We can borrow ideas from other sectors like retail. Think of the Apple store where there are always geniuses to help you and the service feels personal. We don’t have to imitate the commercial sector – we can invite the commercial sector to run the libraries. Yes, we are talking about privatisation! The way we work now is very resource intensive, lots of paper consumption, lots of printing, energy-intensive buildings, wasteful procurement processes, but that’s the old way, boo! Forget the irrelevant comments about “rainwater collection”. Libraries are “very resource intensive” and we’re going to change that. Libraries can encourage their staff to take public transport or walk or bicycle to work by providing storage areas for bikes, shower rooms and staff reward programs. No car parking (except for senior managers). We’ve sold the car parks to property developers. And with staff reward programs we can reduce wages. The new librarian is open to new possibilities and is constantly evolving. Our plans are still evolving. We wonder whether we can explore income generation deals with Facebook and Amazon – we deliver the customers’ eyeballs and the shareholders make the money. The development of the hyperlinked library of the future goes beyond the technologies. But it also needs to address the political and economic context in which the library service operates. I’d therefore invite a discussion of these issues.